I think it’s time for more candy! Last week’s Turkish taffy is now safely out of my house and in the hands of my mom and dad. I decided that taffy would be an excellent birthday present! So, I gave a big bag of taffy to my mom while we were in New York City this weekend. Although, I’m feeling like I need to make more since I only ate one piece! This week we’re heading back to chocolate land! I decided to make some very fancy, artisan chocolates this week. I can call them artisan because I made them with my hands, right? This week it’s time for truffles. Since we are only in week four of Candy Challenge 2011, I decided to start with a simple chocolate truffle. Get the basics first, then try to launch myself into a wide array of truffle flavors rivaling that of See’s candies. 1. 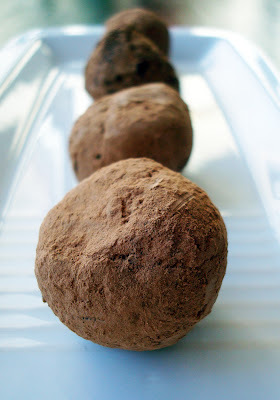 Chocolate truffles are basically balls of hardened buttercream frosting. Delicious, yes. Healthy, no. 3. Do not make truffles on a warm day. In fact, you have a friend with a really cold apartment/kitchen. Go there. Bond over making truffles. 4. You will be covered in chocolate, invest in an apron. Not a cute one with ruffles, a black one. Reserve the cute on for less dirty tasks. 5. Rolling truffles in straight cocoa powder, following the recipe directions, will lead to a bitter outside, contrasting starkly with the sweet truffle. This might be a good thing in your opinion, I got mixed reviews from my taste testers. Although all of the truffles were eaten at the end of the day. 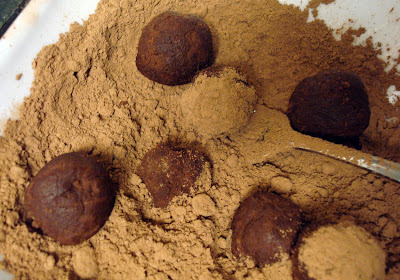 There we are, truffles are a little finicky and they took a full evening to make. However, if you are looking for a shot of chocolate in the afternoon, these will not let you down. They are rich and creamy (because they are made out of chocolate and butter). 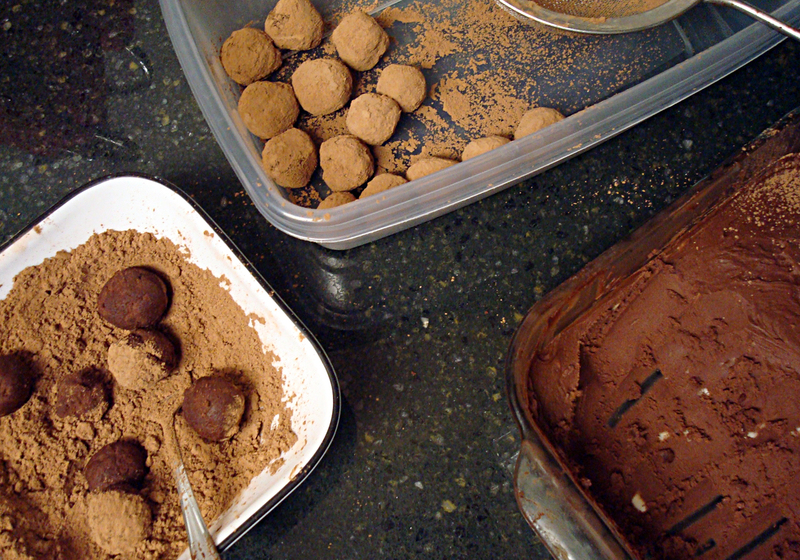 Be prepared for more truffles in the coming year, I’ve got some flavor combinations that are itching to be made! What’s your favorite truffle flavor? Mine is Key Lime, yum. Melt the unsweetened chocolate in a double boiler (or a bowl placed on top of a pot of simmering water). Set aside to cool slightly. Beat together butter and powdered sugar until smooth. Add heavy cream and beat on low until combined. Quickly add chocolate and vanilla, beat until just combined and there are no streaks of chocolate remaining. Transfer to a shallow dish and refrigerate for two hours. 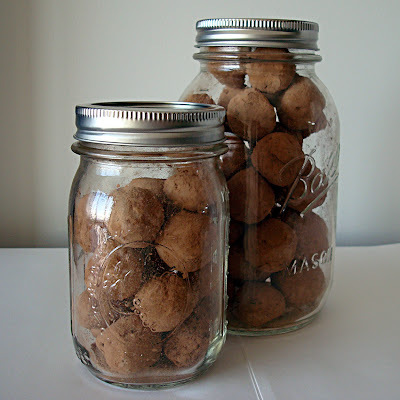 Scoop out teaspoons of chocolate and roll into balls in the palm of your hands. I recommend using gloves when forming the balls. Roll in cocoa powder and shake off excess. Store truffles in the fridge for up to two weeks.